IMAGINES has won a prestigious SILVER ICAD AWARD as one of the best pieces of Irish Design 2016! IMAGINES is an edition from New Dublin Press that gives one faith in the ability of artists from different genres to meet with a common cause to deliver a certain enlightenment on a subject that might at first seem obscure, but in fact touches upon contemporary reality. Every little detail on every page is astonishingly beautiful and out of the ordinary. One cannot fail to sense the ultimate care and love which has gone into this production. This limited edition, bespoke book brings together four scores by Irish composer Benjamin Dwyer, poems by Kimberly Campanello, commentary by NDP editor / publisher Jonathan Creasy and viola performance by Garth Knox. 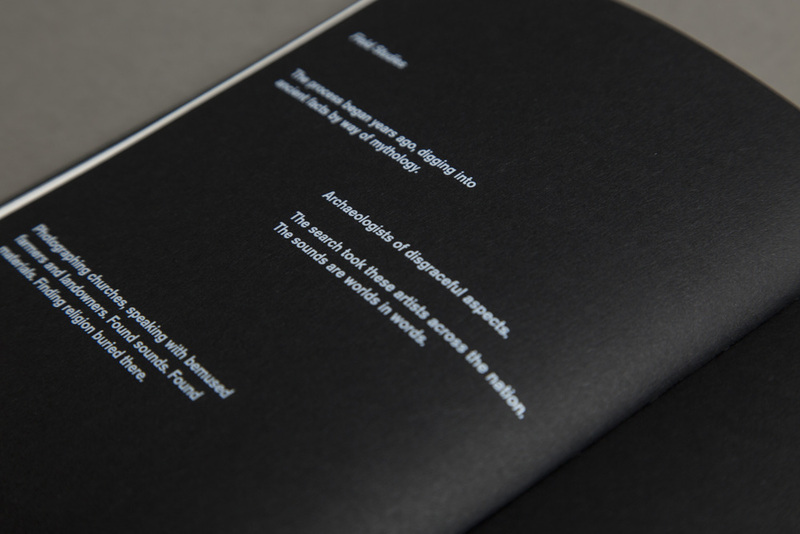 The book was designed by Rossi McAuley and his Distinctive Repetition studio (Raglan Rd., Dublin). Each book in the first edition of 84 copies was used in performance and exhibition at the Barrow River Arts Festival, Borris House, Co. Carlow, May 16 - 17 2015 (curated by Maya Homburger and Barry Guy). Knox and Campanello premiered the piece at the launch. Dwyer's score and Campanello's poems were written in response to the enigmatic sheela-na-gig carvings found in Ireland. The two artists traveled through the country documenting what they found and making field recordings and drawings. They completed the pieces in the Heinrich Böll Cottage, Achill, Co. Mayo. The score features many 'extended techniques' mastered by Garth Knox, one of the finest violists in the world. Dwyer composed the piece specifically for Knox, whose performance is indispensable. After gathering the material, NDP editor and publisher Jonathan Creasy brought the project to designer Rossi McAuley, who created an entirely unique 'musical typography' based on Dwyer's hand-written scores. Creasy authored text that runs through the book, amid poems, scores and photographs. This book is an art object, designed to maintain the mysteries of its subject. Purchase of Imagines includes access to a studio recording of the piece (samples above), produced by Benjamin Dwyer and Jonathan Creasy, recorded in London by Joe Leach at Cow Shed Studio. The recordings were mixed and mastered by David Young, Widget Studios, Philadelphia. For institutions interested in acquiring a full exhibition set of Imagines, please CONTACT US. “Imagines is a collaboration in the finest tradition. I had the sense of each artist – poet, composer, musician – embarking on an archaeological dig within self and symbol and then surfacing and coming together with their primal finds, their offerings. There is something almost alchemical about this fusion, this union, something mysterious and beyond words. The performance itself is intense, electric, disturbing. It is as if the finely-tuned ears – and souls – of these artists heard the cries of ancient females stored in old stone and drew them out, bore witness to the buried memory and collective pain, and then transmuted them into this work of art.